In an effort to drown myself in my own hobbies and self interest, while also avoiding doing any actual work on myself, I worked on a cake for my monthly baking project, #ssyearofcake. I know I know.. I'm a little late for May's entry. But I was able find some peace with my own flawed personality while decorating this one. It's hard recognizing that the problem is still me, but I'm confident that someday I'll find myself in a healthy relationship that feels like less of a burden and more of a partnership. Uh oh, is this post getting a little too self aware? 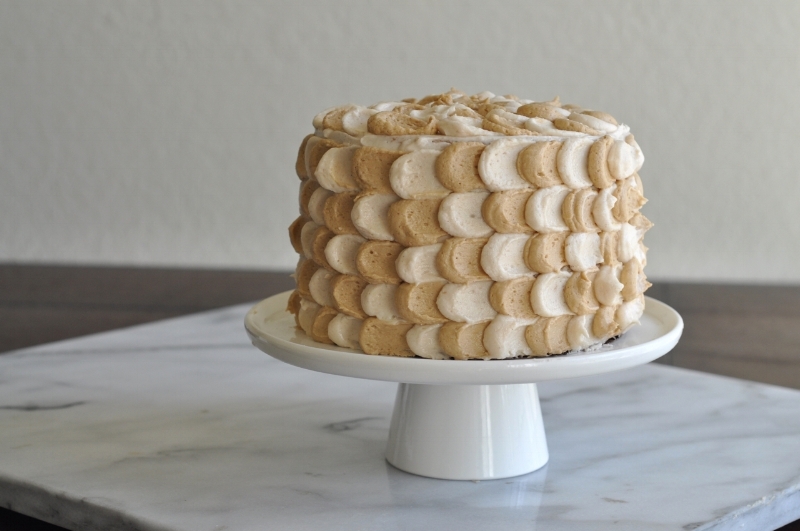 This cake combines two of my favorite flavors, coffee and cinnamon. I've written plenty about my love affair with coffee, and about its ultimate removal from my life. I love the dark, rich flavors, but I can't ignore that even the smallest cup triggers my anxiety in the most unforgiving way. So thank god for coffee extracts, which insert the flavor into baked goods without the ugly side effects. Both flavors are infused into my favorite vanilla cake recipe of all time, as well as into the buttercream I used to decorate with. 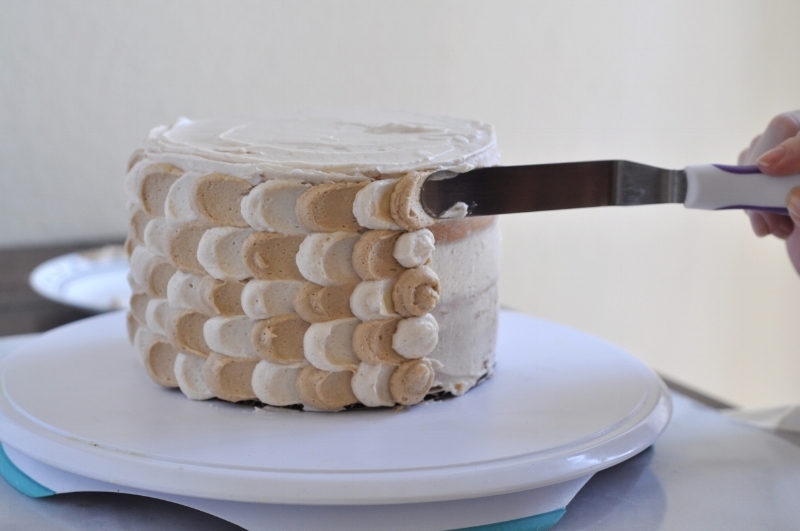 The lighter colored buttercream is laced with cinnamon while the darker layers project more of a coffee flavor. I've been meaning to try out this method of decoration for awhile, where the cake ends up looking like it's covered in fish scales. And I always thought it was going to be too difficult. Luckily, a few weeks back Adrianna from A Cozy Kitchen did a mini tutorial on her instagram story where she showed how to achieve it. Guess what, it's not hard at all. In fact, the only downside was spending about 45 minutes hunched over a 6 inch cake that unfortunately resulted in activating a very sore spot on my left shoulder. But l mean... it was totally worth it. As usual, I brought this cake to work and it was a huge hit. Because while I may not be able to succeed in the world of dating, the one thing I've managed to always excel at is stuffing my coworkers with sugar. me when i'm avoiding contact with the outside world. Preheat oven to 350 degrees Fahrenheit, and prepare two 6 inch cake pans by buttering and flouring, then lining with parchment paper. To make the cake batter, begin by combining flour, sugar, baking powder, salt and cinnamon in a large bowl. In a separate bowl or liquid measuring cup, combine the plant based milk, vegetable oil, aquafaba, apple cider vinegar, vanilla and coffee extract. Slowly add "wet" ingredients into the flour mixture until a thick batter has formed. Divide in half and pour into prepared baking pans, bake for 30-35 minutes until an inserted toothpick comes out clean. Let cool for about 10 minutes before removing cake from pans and allowing to come to room temperature on cooling racks. To prepare the buttercream, combine vegan butter, shortening, and powdered sugar until you've reached your desired consistency, adding more or less powdered sugar as needed. I like mine to be spreadable, but still hold it's shape. Divide the buttercream in half, and add vanilla and cinnamon to the first half, and then the coffee extract and brown food coloring to the second half. 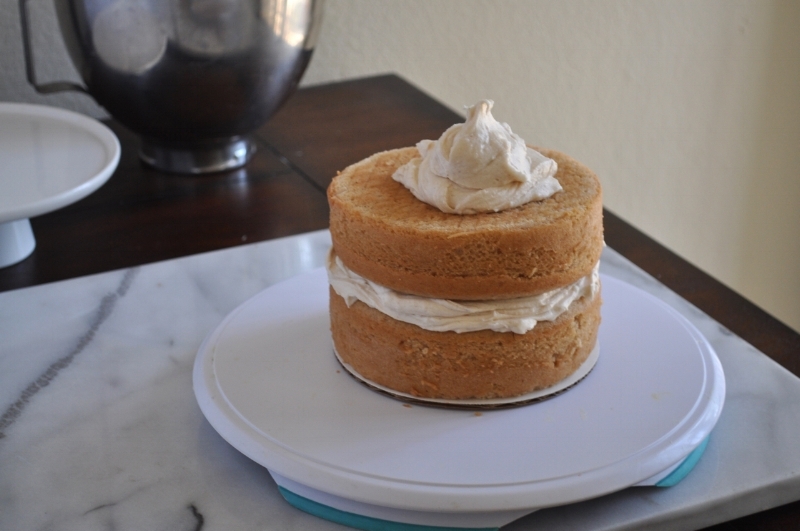 Once cake is cool, crumb coat with the cinnamon buttercream, then set in the fridge for about 10 minutes. 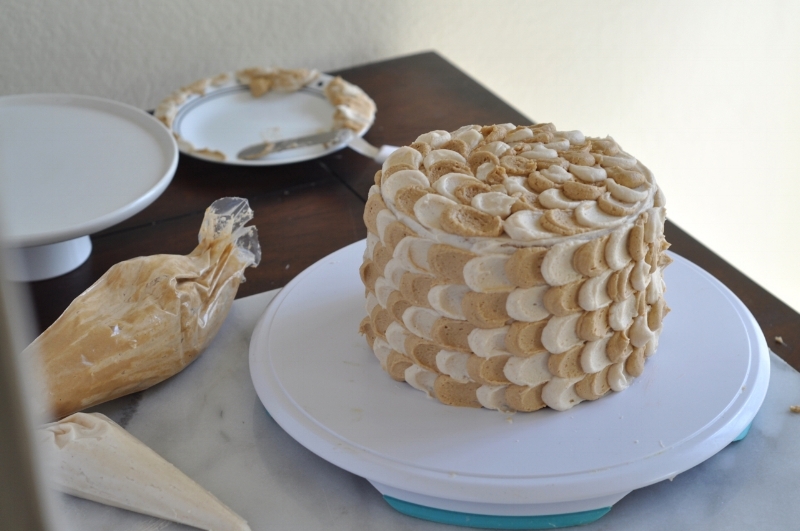 Then pipe alternating dollops of the divided buttercream onto the cake, spreading each one out with an offset spatula before piping another dollop and repeating (see photos in blog post). Frosted cake is best served the day of, but will store well in an airtight container for 3-5 days. ** I've only ever used the Earth Balance buttery sticks in this recipe, and I'm not sure how well a vegan spread or coconut oil would work in it's place. Be mindful of this if you're planning on straying from the recipe as I have written it. I am not sponsored by Earth Balance, I just really dig their products. Special thanks to one of my newest and most treasured friends, Tommy, for proofreading this post for me. My site uses amazon affiliate links, which means that if you click on that link and purchase the product, I get a portion of the sale at no extra cost to you. 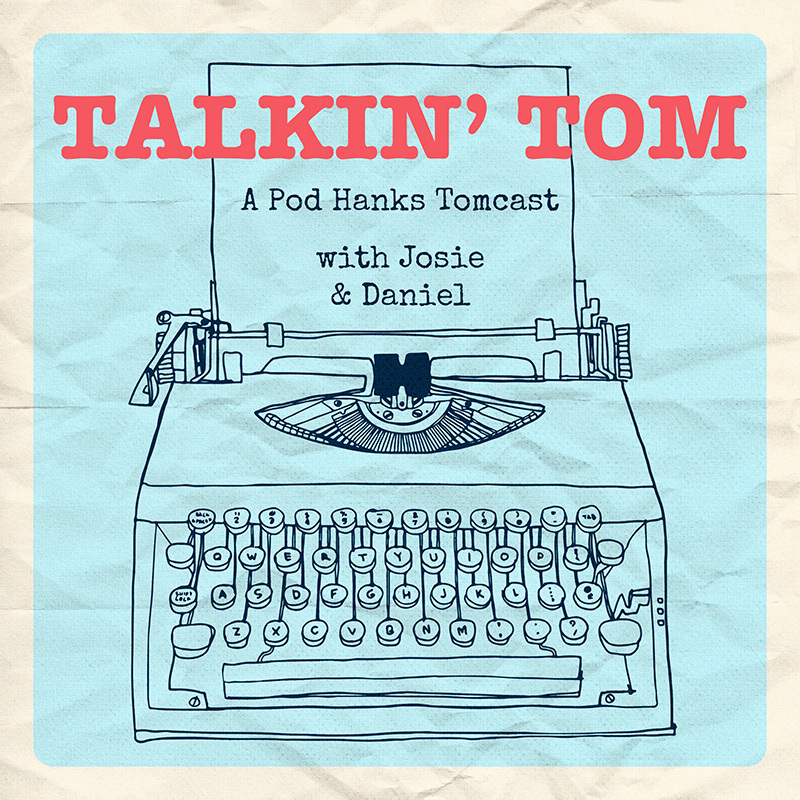 Thank you for helping support Sugar and Satire as it grows.